The ECU will go into open loop mode and throw a code. But it may be better than running with faulty information from the O2 sensor. What would be the A/F mixture in open loop? Factory default (after disconnecting the battery for awhile so the ECU loses it's memory). Don't get me wrong. I'd LOVE to try my hand at brazing, And I really wish this could be brazed and done right. However, I don't know how to braze, and don't have anything hotter than a plumber's torch. Besides, given my sheer incompetence, I'd probably burn a hole in the manifold before getting anything brazed. And that would be counterproductive, to say the least. You don't need an Oxy mixture to braze with, propane would be fine, maybe MAP gas if you want a little hotter flame, and w/a little common sense you shouldn't have any concern melting a cast iron manifold. Since you have the torch already, pic up some rods and practice with some scrap steel, and go from there. If I had any assurance that it would be worth it in the end, I'd try that header. But I don't. Wow, what kind of propane torch is this? I've tried brazing with that torch before, and it can't even do 3/4" thin-wall pipe. Liquid propane with a siphon tube or holding the bottle upside down? Can you braze cast iron without an oxy-acetylene torch? I didn't know that propane or MAPP gas will produce enough heat? I can't braze 3/4" thin-wall tubing with propane... I doubt that big heavy casting could be brazed with anything short of an Oxy-Acetylene torch. itd be better then what you "dont" have. i say buy it, check the welds on it and install it. You aren't fuse welding the cast iron, just trying to seal up the cracks, so you only need to be able to melt the filler material. Propane in air has a burn temp of 3500*, but lacks the BTU's so you need to make sure to block the flame from the wind, and not trying to heat a large area. It only burns a little cooler than MAAP, and MAAP gas has worked for me in the past. I use this torch, and preheated the manifold on the BBQ. 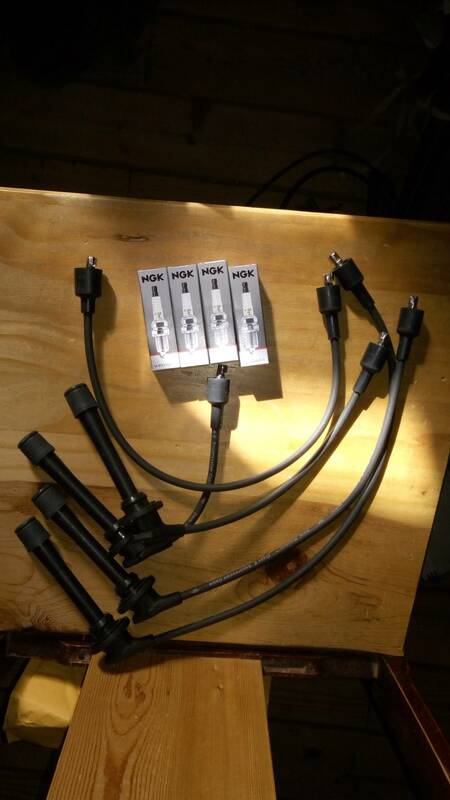 If want a hotter flame(5000*F), go with this MAAP/Oxy torch kit for $60. I don't have a place out of the wind to do the job. And some cracks are hairline cracks and require at least a little adhesion. Also, I'm told that air movement will crack cast iron as it cools down from brazing, which makes me a little nervous. Just need a way to block the wind, from 3 sides. With the cracks being problematic enough to cause loss of exhaust gas velocity and replacements being over $300, you really aren't risking anything trying to braze it, and unlike any of the paste stuff, the filler wont burn off within a mile down the road. ThermoSteel, it turns out, bears a strong resemblance to refractory cement with iron filings in it. The stuff has now held up to several heat/cool cycles. They claim it is good to 2400 F, and it has so far survived just fine. If the long term becomes a problem, I'll have it brazed. I also found a voltage leak -- started unplugging spark plug wires until I found that #3 didn't make a difference plugged or unplugged. This is now patched temporarily to see what happens to highway performance. If it doesn't run way better on 4 cylinders than 3, something is badly wrong. However, it's always run hotter than I like. I've purged the cooling system (got no air out anyway), checked the radiator with an IR thermometer, and recently replaced the thermostat. I got the gauge in the dash cluster to work; the temp needle is usually 3/4 of the way up to H. According to my aftermarket NAPA gauge, this is around 200 F, but I don't know how accurate that thing may be. There are no collapsed hoses, and the fan clutch seems good. If the water pump were bad, it should be actually overheating, leaking, or making funny noises. I guess this leaves gremlins or deus ex machinae. Any talented cooling system exorcists out there? Definitely check out the WARFS stuff. There are some very interesting fixes there for the lack of adequate cooling there. One I remember seeing is that an S-10 radiator (along with an Isuzu alternator, but that's a different problem) essentially bolts right in and does a better job of cooling. Other misc fixes are there, too. I took the Rocky to town and back the other day. It ran really well on the drive in and most of the way back. Then on the last hill on the highway, the needle began climbing up nearly to the danger zone (from 3/4 of the way there). I turned the heater on full blast and struggled to the top of the hill, fighting to make the thing even move. Nearly at the top, the "check engine" light came on. I coasted down to the bottom where my driveway starts, parked, and walked the last mile home. It was a good walk. Later, I read the code: "Rich mixture". I am discouraged. The water pump is good, the radiator is clean, and the thermostat is almost new. None of the hoses are collapsed. I just replaced the head gasket. The fan belt was loose, but not squealing, so I assume it was still hanging in there. The fan clutch was dismantled and shown to be underperforming. It's now been refurbished with some heavy-weight gear oil. However, based on what happened, I strongly suspect that the HG is blown again due to frequent running at 200-220F and close to the danger zone on the gauge. Running hot when (but only when) the engine is asked to work hard is almost diagnostic for a leak between a coolant passage and combustion chamber, right? Especially given the number of other cooling system components known to be good? Not only do I have cooling problems, that "rich mixture" thing has me worried. It suggests that I've damaged something else really badly while I was at it. Do a leak down test, and get the head resurfaced. Assuming you didn't when you pulled it the first time? No. The time I had a chance to do my head gasket, there was a snowstorm coming on and I barely had time to get stuff put together to where blowing, driving snow wouldn't damage anything. I'd like to do a leakdown test; 15 minutes of data would be way more informative and useful than hours of random, ignorant, uninformed speculations by Lewis. I'll have to see if I can find the right hardware to fit those odd-sized spark plug holes way down in the engine. As for resurfacing the head, I think my little milling machine might be up to the task... maybe. An engine like this that is basically ruined already might be a good one to learn on for that kind of job. If you didn't have the head resurfaced and inspected when you replaced the HG, it could be why you have had high engine temps since, and now overheated. As for resurfacing the head, I think my little milling machine might be up to the task... maybe. Surfacing is only part of it, can you pressure test it as well, cracks aren't always easy to find visually. Unless you're blowing coolant out of the system, the HG is probably good. Is the radiator 'cleaned' or 'new'? Sounds more like a clogged radiator to me. 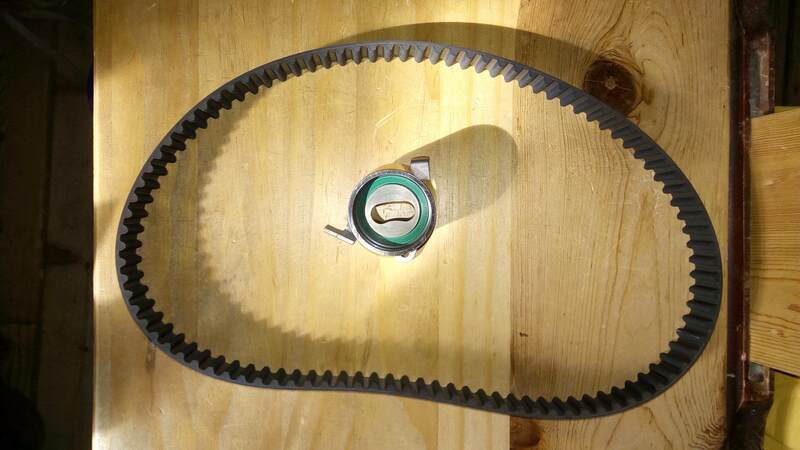 2 more possibilities are a slipping fan belt, and the fan clutch is slipping to much. 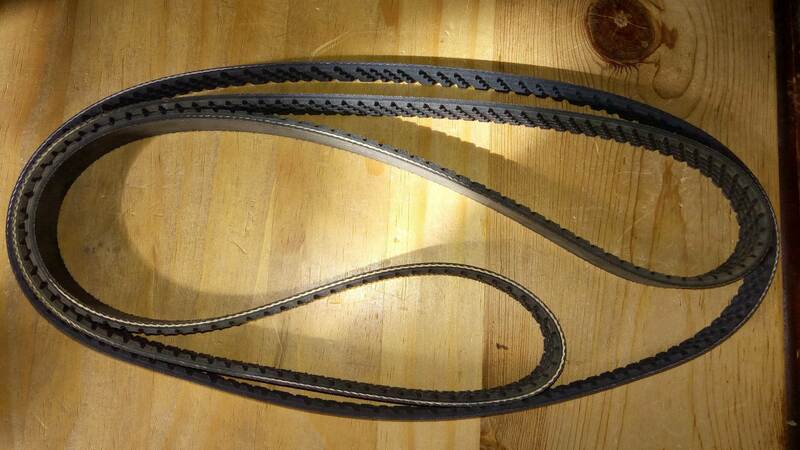 The fan belt could look/feel tight, but be too narrow for the v-groove and be slipping. Send me a PM and I can send something along to them. However, you should be able to see all text at this point. I think the account let's you post and view pictures. Additionally, you need to be a "member" to view the service manuals and wiring diagrams. That's like $5 with PayPal. Got some Daihatsu parts today. If it don't run good and stay cool after I have it all back together, there's going to be an unhappy guy sitting in my chair. So, I went to put on my new timing belt today and... it won't fit. No matter what I did with the tensioner, the belt stayed loose. Fact 1: I have a belt that came off the Rocky: it fit, and has 93 teeth. Fact 2: The belt I received has 95 teeth. Fact 4: The Daihatsu Charade came with a 1.3 liter engine, which (according to RockAuto) takes a 93 tooth timing belt. Conclusion: Somebody either put a straight-up Charade engine in this thing, or some strange hybrid. 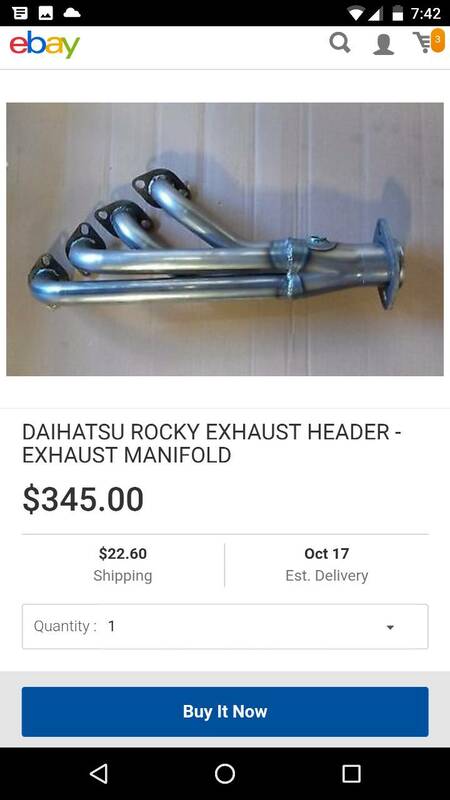 RockAuto cannot fix that for me. GRRRRRRRRRRRRRRRRRRRRRR. My parents have told me fond memories of their Charade, drove from SLC Utah to Alabama... I was told they were passed by semis up hill. This thing would most assuredly be passed by semis up a hill. It weighs as much as my pickup yet the engine is about half the size. It struggles to climb even a moderate grade above 35MPH. It is a 4-cylinder Charade engine, which is better than having a 3-cylinder. But if I could find a 22R or 3RZ at a price I liked, and if I had time, I'd put an engine in there that actually had some oomph. There is no way that there is a Charade engine in there. On what basis do you say that? I think the evidence is in my favor: The engine is definitely not a rocky engine, and matches the specs for a charade engine to a T. Moreover, on your suggestion, I searched WARFS. The following thread suggests that a charade engine in a rocky is indeed possible. Of course, there's always the chance that I'm wrong anyway. Bring on your evidence! Nope. Offered help before, and it's ignored. Best wishes! Based on the gearing and diff gear(5.29 stock if correct), at 40mph w/29's your rpm's are about 2100, which is too low to have any performance due to its hp/trq #'s and where its power band is,at 60mph it would be about 3100rpm's. 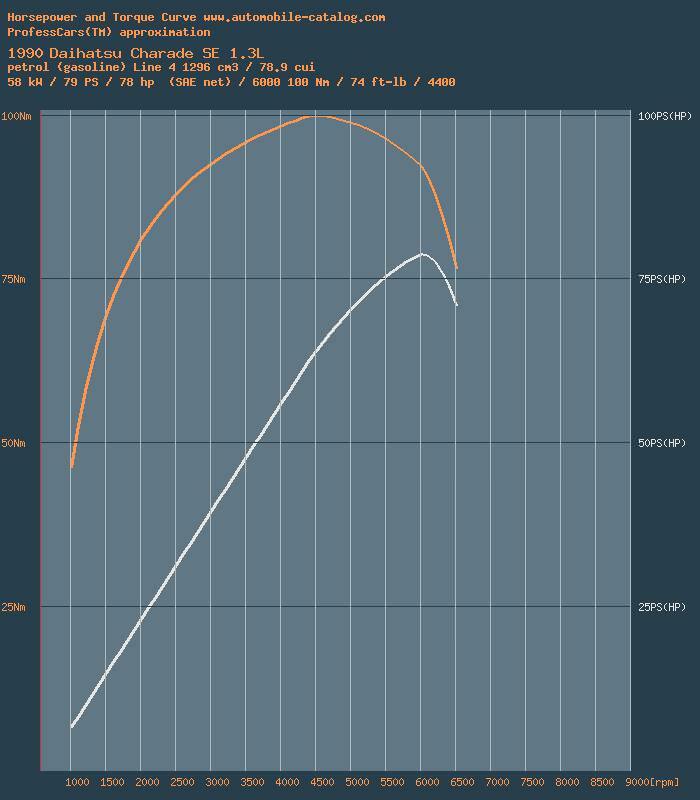 Does your magic program that generated this curve know anything about the Charade engine torque and HP curves? 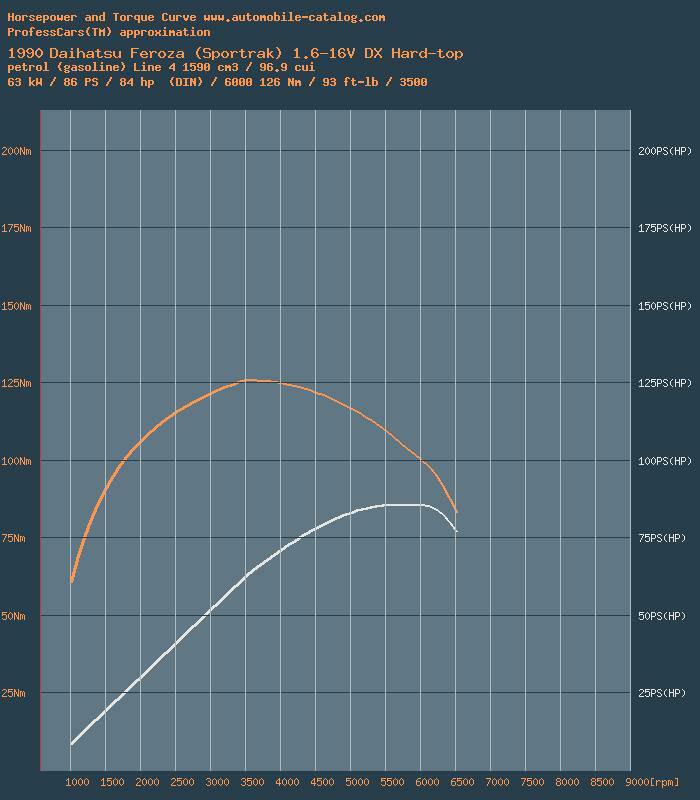 Info on the web is scarce, but I'd love to see some actual curves. My best guess is that the Charade engine might just like to rev way up. Of course, though, if this is a Charade/Rocky hybrid engine all bets are off. Wasn't a program, found the info here Automobile-catalog, Charade, same site. 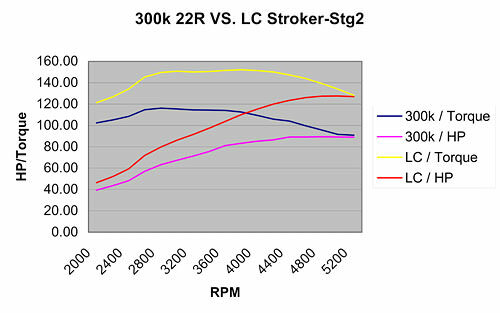 If it is a Charade engine, not only do you have the lower HP/TQ, but an additional 800lbs more weight with the Rocky. Thanks so much for pointing me to that site. Fortunately for me, the situation isn't so dire as your graph suggests. This is not the I3 993cc engine, but rather the I4 1296cc engine. So we see that the Charade engine has almost the same max power as the Rocky engine, but at 6000 RPM instead of 5000. The available HP falls off real fast at lower RPM. Page created in 0.347 seconds with 33 queries.